There are trade shows and then there's Dreamforce. The annual event, orchestrated by Salesforce, is one of those conferences that has gone far beyond its origins and has become an industry institution. This year, Dreamforce 2017 features a jaw-dropping 2,700 sessions, and boasts a lineup of keynote speakers that can only be described as "star-studded," featuring heads of global industry, top figures in the entertainment world and even former First Lady Michelle Obama. There's going to be a lot to see, to the say the least. And as you well know, even an average-sized show or industry event can make you scramble to squeeze everything in. 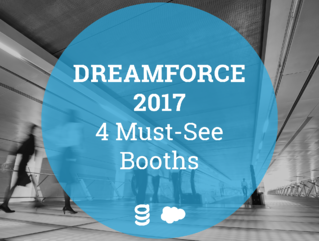 With an event on the scale of Dreamforce, sketching out a plan is a must to make sure you can touch base with the standout vendors you want to see in a whole sea of gems. So as you're readying yourself for four days of learning, networking and demonstrations of some of the most innovative solutions now hitting the enterprise technology landscape, make sure not to miss the following four vendors. Determining what you must see beforehand will set you up for getting the most out of your Dreamforce experience – and these are vendors that you're not going to want to miss. Acumen Solutions is a large Salesforce SI (system integrator) partner - one of the things we find most interesting about Acumen is their work in the public sector. As government agencies and other public enterprises realize that they can benefit from embracing secure technology as much as the private sector can, they're turning to vendors like Salesforce, and integrators like Acumen, to meet their unique needs. To further the public sector's tech-forward movement, Acumen also partners with SpringCM to handle its customers’ documents and contracts. Swing by Acumen's booth to get the inside scoop on how the company works its magic. Or if you're looking for a bit of peace and quiet, Acumen will also be at a SpringCM-sponsored section outside of the event (touch base with a SpringCM representative at Dreamforce, and we'll see what we can do about getting you an invite up there). In our world of leading-edge technology, it's easy to think of everything important taking place on the screen. Even with modern technology, people still need a way to get from one place to another, quickly, and the many of those flying into Silicon Valley to attend Dreamforce are going to be frequent fliers. This is undoubtedly part of why Alaska Airlines – which recently acquired Virgin Airlines – is a featured sponsor of Dreamforce this year. In addition, Alaska Airlines has been heavily promoting its dedication to the San Francisco Bay Area, with highly-visible moves like the rolling out of a San Francisco Giants-branded Airbus; the official plane of the team, painted with team colors. So drop by their 20x20 booth and see what the U.S.'s fifth biggest airline has to say about their plans to continue helping Silicon Valley take flight. Online reviews basically drive commerce these days – any retailer will tell you that reviews on the right platforms can make-or-break a business, and vendors selling on marketplaces likewise sink or swim on the strength of those star reviews. Recognizing that people want to make informed decisions about what they spend their money on, G2 Crowd launched a platform that is quickly revealing itself to be just what the business world need – a B2B review platform. With G2 Crowd, companies can get honest user feedback on technology vendors..
That's why it's well worth working G2 Crowd into your busy Dreamforce schedule. You can chat them up about how their platform works, and explore ways to get the word out about the great experiences you're having with SpringCM and the other innovative ISV partners that are helping you do business better. Once you've had the pleasure of chatting with these other great vendors, swing by Booth #1118 (our big booth in the Expo Hall) or our VIP Lounge #1406 and talk to us! We're proud to say that we're Platinum sponsors of Dreamforce this year, our biggest sponsorship yet. We're thrilled to answer your questions about how we're helping businesses and organizations of all sizes streamline their contract and document workflows to make work flow. I can’t wait to see you in San Francisco!